In adddition to all the scheduled gaming events, there will be many gamers participating in Open Gaming. In open gaming, you choose a game, find some interested gamers, select an available table, and play. Here's how Congress of Gamers helps you get gaming. 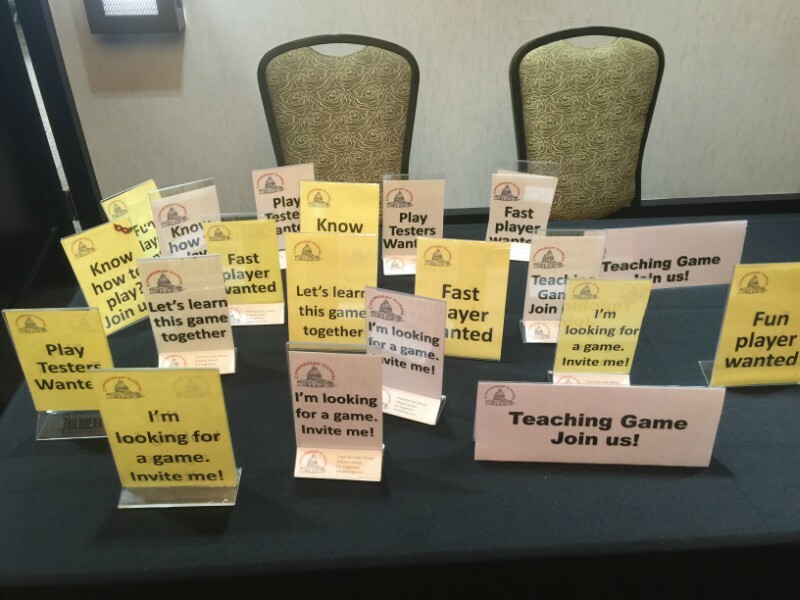 Find players - Many signage options will be available. You place one of these at your table so gamers will know what you are looking for. Select table - One of the great features of the Senior Center is its mutiple rooms with different table types. Want to play an eight player Eclipse game? We have huge tables for that. Want a quiet place, a table with lots of natural light, an outdoor picnic table, a table with lots of traffic? We have those. Don't be afraid to join the many tournament games. Just because they are part of a tournament doesn't mean a non-tourney gamer can't play. Just make sure you know the rules before joining a tourney game. One of the Open Gaming rooms.